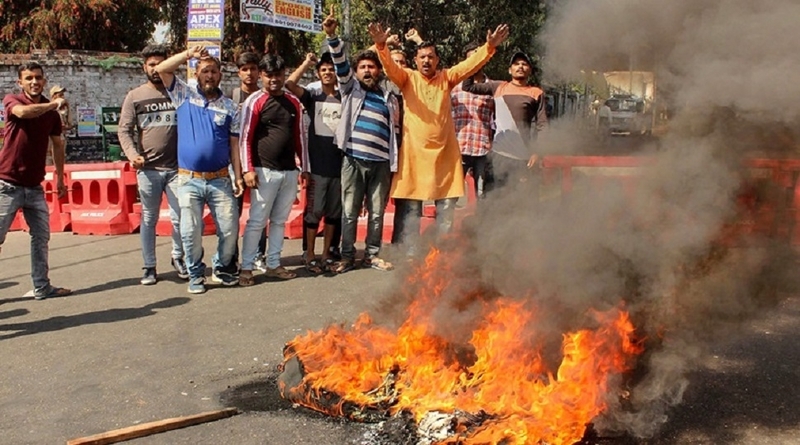 VIOLENCE broke out in Jammu and Kashmir’s Kishtwar town on Wednesday as angry mourners clashed with police during the funeral procession of the senior RSS functionary killed in Tuesday’s terror attack along with his PSO, prompting the Army to stage flag march in the area. No one was injured in the clashes, officials said. Curfew remained imposed for the second day in the communally-sensitive district following the killing of senior Rashtriya Swayamsevak Sangh (RSS) functionary Chanderkant Sharma and constable Rajinder Kumar, even as police intensified searches to nab the assailant. According to eye-witnesses, a large number of people came out of their houses to take part in the funeral procession of Sharma. In Dak Banglow area, an irate crowd held protests and raised slogans against Pakistan and terrorists. The group soon turned violent and pelted stones on police personnel deployed there. During the clash, police resorted to cane charge and teargas shelling to disperse the protesting mourners and brought the situation under control. The slain RSS leader was cremated at Chowgan ground in a ceremony attended by Sangh leaders including its J-K Chief Suchet Singh, BJP State President Ravinder Raina and former Deputy Chief Minister Dr Nirmal Singh. The mourners shouted slogans like ‘long live Chanderkant’. After the cremation, the crowd turned violent again and stormed the office of the Superintendent of Police. The protesters ransacked some furniture and pelted stones. Police used cane charge to disperse them, they said. The Army conducted flag march in the city after the incidents. “There were incidents of violent protests (at two places). Some protesters entered SP office, and ransacked of some furniture item. But situation has been brought under control and curfew is imposed,” SSP Kishtwar Shakti Pathak told PTI. “There were some incidents, because tempers were running high. However, the situation has been brought under control”, Divisional Commissioner, Jammu, Sanjeev Verma told PTI. Constable Rajinder Kumar was cremated in his native Mughal Madian area of Kishtwar where hundreds of people gathered. Dogra Swabhimaan Sangthan (DSS) Chief and candidate for Jammu and Udhampur Lok Sabha seats, Choudhary Lal Singh, was on Wednesday detained with his supporters when they were on their way to Kishtwar, officials said. The former Minister was detained in Assar area of the Doda district, they said. RSS calls for handing over Kishtwar to Army, extending of Ops Allout: CONDEMNING the killing of its leader and his PSO in a terrorist attack in broad daylight in Kishtwar, RSS on Tuesday termed the attack a “security lapse” and called for extending Army’s ‘Operation Allout’ in the hilly district to prevent spread of terror in Jammu region.